Deep in the dark forest lies an abandoned witch's hut! Break the window glass and steal a look at the magical room filled with all sorts of potions prepared with a pinch of bee's knees, the eye of a frog and a unicorn horn substance. Dive into Thunderkick's mystery world where frogs drink grog and grant big wins. This exciting video slot is played with five reels on three rows and 23 possible ways to win. You will also find several symbols and bonus features like dropping symbols, wild frogs, multipliers and mystery game to boost your chances of winning. Besides the attractive graphics and animations, Thunderkick has used an immersive soundtrack and effects that blend perfectly with the theme. If you love wizard themed video slot, this medium to high variance game will provide you with the best gaming experience as well as chance to win up to 161600 coins. Frog Grog video slot offers a betting range of between $0.10 up to $100 and a relatively high theoretical return to player of 96.1%. Play online at bCasino from your personal computer, smartphone or tablet and become the next biggest winner. Thunderkick's Frog Grog slot will put you in suspense upon loading. At first, you will not see any frog. The frogs in this game are represented in the title and the logo, but the playing screen will have you searching for anything frog-like. The game is presented in a thick forest where the witch lives in a hut. 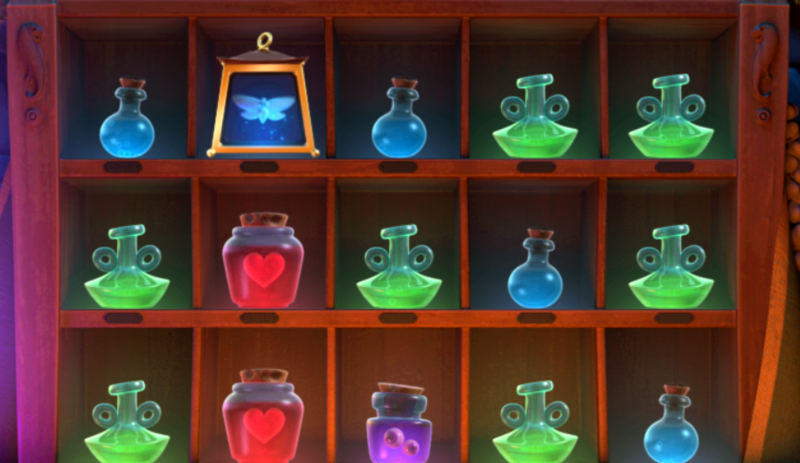 The hut is packed with all sorts of magical potions to cure different misfortunes. There is also a cauldron with some strange concoctions boiling and other eye-catching items such as a heart in a jar as well as a human and animal skulls. The strange looking liquid will vanish mysteriously into the cauldron to make a cocktail of strong concoctions. This will help you to see a square-shaped clear box with other bottled substances. As you continue gazing around, you will hear a thrilling soundtrack playing. This will be accompanied by strange laughter that will be heard occasionally from the background. The developer has an excellent choice of colors. Every item in the witch's hut will be glowing in golden-purple to create a good atmosphere. The strange liquid will start to boil when the symbols land to create win lines. Unlock the Mystery Game to see the cauldrons flush out a blue mist which makes the game more attractive and fun to play. 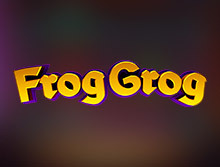 Frog Grog is not only simple but fun to play as well. The game is played from left to right on the 23 win lines, three rows, and five reels. To win, you need to get three or more of any conventional symbols starting on reel 1. Although the payout may seem smaller compared to other Thunderkick slots, there is a bonus feature to increase your chances for big wins. The jackpot or the highest payout of the slot is 200 times the bet in the base game, and this can increase up to 1616 times the most top bet amount of $100. The standard minimum bet per line is $1 coin per line/spin. Also, the value of each stake will vary between 10p up to $100. You can adjust your bet at any time during the gameplay. Click on the Bet button at the bottom of the screen to set the bet. The button on the furthest on the right at the bottom of the screen will initiate the reels. The Autoplay button next Spin will enable you to set up to a maximum of 5000 spins to play uninterruptedly. The good news is that Frog Grog is jam-packed with several unique features and symbols to help you win more. The symbols are divided into high value and low value and offer different payouts as indicated on the pay table. The highest paying regular symbol in the game is the Month, and it pays out 80p, $1.70, $10 for a Total Cash Bet of $1. The Rose is the second highest paying symbol in Frog Grog slot game. The wild symbol is the frog on the reels and comes with numerous benefits. The wild will make all the symbols in the same column and row explode if they appear and not form a winning combination. This feature works like the cascading reels, where they make symbols to disappear in a winning combination to let players create more winning combinations. This feature works hand in hand with the dropping symbols. Each time there will be a winning combination and the symbols included to the cauldron the multiplier in the game will increase. This can go on up to 7 times the standard value of the bet. This feature will be activated randomly by some spins when there has been no winning. The mystery game feature will drop all the symbols except the highest paying symbol in the cauldron. All video slot games from Thunderkick are fully optimized for mobile and tablet users, and Frog Grog is not an exception. You will all the high-end graphics and pleasant sound effects instantly without the need for an app or software. The HTML5 technology will enable you to play this slot via standard browsers for Android and iOS-powered devices like Chrome, Safari and Opera Mini. Since 2012, Thunderkick has been making a name in the gambling industry for producing unique slot games. The Stockholm based developing company has partnered with leading casino operators such as bCasino where you can play all their latest slots in free play and real money. Thunderkick holds two licenses from the Malta Gaming Authority and the UK Gambling Commission, which helps them to enjoy a broad market over its competitors. The developers have vast knowledge in matters casinos and are committed to ensuring that you get the best gaming experience both on mobile and personal computers. Experienced customer support agent available via email, live chat and telephone.